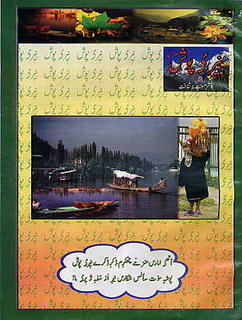 Recently I was amused to discover a Kashmiri literary magazine published from Azad Kashmir in Pakistan. The name of the magazine Neerposh is so meaningful, beautiful as well, that it reminds me of one of the earliest magazines of Kashmiri Kongposh which was published from Srinagar in 1950s. One should appreciate the significant contrast these two names reflect. I had a brief exchange of emails with Neerposh's editor Mr. Altaf Andrabi and in that conversation I learnt that there were and are a few souls who wrote in Kashmiri though mostly for Radio Azad Kashmir. This also reminds of the situation in the other part of Kashmir during 1950s and part of 1960s when Radio Srinagar was the main source of inspiration for Kashmiri writers. 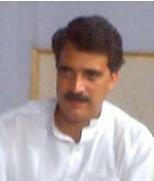 Mr. Altaf Andrabi promised to send the three issue of the magazine published so far. I couldn't believe my eyes when I opened the mail; it was an incredibly beautiful magazine! One must appreciate him for his efforts and resources he has put in this magazine. I wish him success and hope that he'll be able to continue the publication, even if it's sporadic. In the first issue Mr. Altaf Andrabi writes, "Though this fact continues to pinch me that writing in the Kashmiri language outside of Kashmir is not only a formidable task, but also a futile practice, primarily so because of the lack of Kashmiri readers -- those who could read with interest cannot understand it; those who would understand are too busy to read; and finally those who can both understand and spare time, have no inclination towards it. But these pinches are nothing vis-a-vis the pain that I share with many ardent and compassionate Kashmiris. A pain sweet and difficult as well, always searching your heart! How can it let one alone? In order to give it a little vent, it's necessary to reach the compatriots of Kashmir in mountains, in green meadows, in scorching deserts. This journey, though long and difficult, I stronly believe, will be joined and supported by many lovers." One can totally understand the toughness of circumstances in which Mr. Altaf Andrabi has brought out these three issues. The magazine deserves whole-hearted support by lovers of the Kashmiri language in all lands, particularly by those in Pakistani and Indian Kashmir. This 32-page magazine is 8.5 x 11 in size. All the three issues carry pieces by writers from both sides. Most of the pieces are overtly or covertly patriotic. I hope Mr. Altaf Andrabi broadens the gammut of contents in subsequent issues by including writings other than patriotic in nature.